April 14, 2017, 10:35 AM · Let's just say there are a lot of different kinds of violin strings out there, and choosing which kind to use can be a little overwhelming. One factor that can be helpful is knowing and understanding what is at a string's center: is it gut, synthetic or steel? GUT STRINGS: Back in the day, this is what everyone used, as there were no other options. Though they sound warm and appealing, pure gut strings take a long time to stabiliize, lose their pitch easily, and break easily. Jascha Heifetz famously continued to use pure gut strings, even after technology was putting forth new options. It's still possible to get "pure gut" strings, and a number of period-performance ensembles and performers use them. But another more modern option is gut core strings, which are wound with silver or aluminum. That lengthens their life and bolsters their ability to keep pitch, while still allowing for the appealing gut qualities to come through. Gut tends to be the most expensive kind of string, with a shorter life than synthetic or steel strings. By the way, though gut strings are made from "catgut," that term is misleading, as "catgut" is made from sheep intestines, not from cats. In fact, there is doubt that our feline friends were ever part of that equation. Some gut strings options include: Pirastro's Chorda, Eudoxa, Gold Label, Oliv and Passione. SYNTHETIC-CORE STRINGS: Invented in the 1970s when Thomastik-Infeld began producing the revolutionary Dominants, these tend to be the most commonly used strings. They are stable in pitch, last long and produce a tone that can be (arguably) as rich and complex as gut strings. They are priced in the medium range - not as expensive as gut, not as inexpensive as steel. There are SO many kinds on the market, but some of the most common include: Thomastik Dominants, Evah Pirazzis, Larsen Tziganes, Infelds, Tonicas, Visions, Zyex, Obligato, and many more. STEEL-CORE STRINGS: Bright and focused, these thin strings tend to be the easiest to keep in tune, as well as the least expensive. They are popular among non-classical players for that direct sound and also work well on fractional instruments. Their stability makes them popular with school programs. Their sound tends to be simple, without a lot of overtones. Different kinds include: Chromcor, Helicore, Jargar, Kaplan, Larsens, and Red Label by Supersensitive. Thank you to Morgan Watkins for this vote idea! if you have an idea for the Weekend Vote, please e-mail your idea to editor Laurie Niles.! April 14, 2017 at 06:52 PM · I love the sound of Eudoxa strings with a wound gold E string, however they are not very practical for daily use because they have such a short life. They are also hard to keep in tune in changing climate conditions. So I use Synthetic core strings except for a gold wound E string. April 14, 2017 at 06:55 PM · I am very happy with my steel E, synthetic core/aluminum wound D and A, and my synthetic core/silver wound G, all Dominants. April 14, 2017 at 07:00 PM · Multi-strand steel core. April 14, 2017 at 07:55 PM · Brent, what kind (label) are those? April 14, 2017 at 09:21 PM · My best violin performances were given using gut, but that's many years ago. April 14, 2017 at 09:51 PM · My Eva Pirazzi Gold had a tone that was too smooth for my taste, and the D string was thick, making it difficult for the bow to bite. I'd get delayed onsets. So toward the opposite extreme, I got Hellicore. They were easier to play and they sounded fine, no complaint about tinny tone. I like them for Scottish fiddle. April 14, 2017 at 09:51 PM · For fiddling I prefer multi strand braided steel core aka rope core in particular Helicore . They have a very quick response and at actually quite warm and focused. For other styles of playing I love the overtones and color of good synthetics i.e. Evah , Peter infield, infeld red. Dying to try Jarger Superior. April 14, 2017 at 10:06 PM · My understanding is that steel strings are a little more sophisticated for cellos and basses, is that true, and does anyone know why? April 14, 2017 at 10:15 PM · I tried the Jargar Superiors and they were very nice strings, after a short break-in period in which I had doubts. But they lasted well and sounded great. I understand that Joshua Bell is now using them. April 14, 2017 at 11:04 PM · I like synthetic core strings, but I regularly experiment in my quest to find the perfect combination for my two violins. Late last year, I bought Evah Pirazzi Gold, with the gold-wound G, for my better instrument. I absolutely love the E string, and am very pleased with the A and D, but the gold-wound G always sounded too gravelly and rumbly on my instrument. I just bought a new set of Evah Pirazzi Gold, except this time I substituted the silver-wound G, which is another option with these strings. Much, much, much better. April 14, 2017 at 11:52 PM · Synthetics work better than I thought. Currently, the Vision Solo set of Infield sound pretty nice on my violin with which I spend most time with a community symphony plus personal practice. Replacing strings about once a year seems about right for decent sound & playability, same for rehair on bows but wear is spread around on 2 or 3 bows. April 15, 2017 at 01:58 AM · I clicked "synthetic core" strings not thinking about my steel E. I guess that makes me a mixer-and-matcher. Sorry! April 15, 2017 at 05:09 AM · Well, mostly everyone uses a steel E (synthetic Es are non-existant due to construction requirements, I think), so it makes sense to say that if you like synthetics, this implies you're using a steel E. I use a full set of Tomica and have been very happy. I vote for synthetic strings. Haven't experimented with much else, though all strings from top manufactures are great. It just depends on what you want. April 15, 2017 at 11:00 AM · Laurie -- D'Addario Helicore, available in three weights and two or three different windings, with a couple of different single-strand Es. 1. 1869: A-D-G: Infeld Red. 2. 1883: A - Passione regular. D - Eudoxa stiff. G - Eudoxa stiff. 3. 1921: A - Vision Solo. D - Peter Infeld aluminum. G - Infeld Red. Also had good response with Oliv stiff D-G on 1883 fiddle. Never tried regular Olivs and didn't care for regular Eudoxa D-G. I find the stiff D-G more pitch-stable, and they give me a bigger, more robust sound that doesn't break or crush as it did with regulars. Pirastro recommends stiff for modern players. The Lenzner/Thomastik split I listed for the 1921 fiddle brought this instrument to life in a way that gut didn't. April 15, 2017 at 02:22 PM · I just put a Kaplan "Amo" A on a student's violin, and she really noticed that it had a sort of gritty feel under the fingers, and I had to acknowledge that she was right. Anyone have experience with those? April 15, 2017 at 04:50 PM · My violin is from a modern maker and is still a bit bright. I have found the Infeld Reds to be a good fit for this violin. I recently included using the Infeld Red E. I was surprised that the sound was quite good. April 16, 2017 at 12:11 AM · Still experimenting. I had great success warming and humanizing one instrument by branching away from all-PI: I added a heavy Passione A and an EP Gold (silver) G. Much woodier sound and an insane amount of projection. After that, I tried Dominant ADG, just to see how it would do with a normal baseline set. That is also doing well, although I may switch back the next round. My other violins have been all-synthetic, although I had a good experience on one using all-gut (wrapped G only) for a period Rossini performance. It wasn't good enough to make a permanent change essential, although it changed the way I listened to pitch for the better. April 16, 2017 at 06:15 PM · Standard Evah Pirazzis with the gold E work really well on my modern Strad copy from a local maker. I tried Dominants, Tonicas, Infelds and Obligatos on this instrument before settling on Evah's a few years ago at its maker's suggestion (I was resisting because it's a bright instrument, but he was right...). But I recently replaced the Wittner Ultra tailpiece I put on it soon after I got it with a Bois d'Harmonie with kevlar tailcord and it made the violin much more responsive and a bit brighter; may revisit the string selection since Evah's are getting so expensive--I suspect a cheaper string may work better now. April 16, 2017 at 07:34 PM · "Gut tends to be the most expensive kind of string, with a shorter life than synthetic or steel strings." I have to disagree with you on that statement. I find that Oliv strings (D and G at least) last much longer than synthetic strings. So while the price of the single string might be higher the cost is lower because I get longer use of each string. April 17, 2017 at 12:48 AM · Yes. There's talk on this forum that gut (especially plain gut) lasts longer than anything else except the E. There's nothing wrong with using gut strings as a vegetarian. I believe in a philosophy that's against the killing of animals and I could be punished for killing beings and consuming animal products. I think gut strings are made from the leftovers of killed sheep, so you should be okay. After all, I'm perfectly happy with synthetics, but don't let religion and philosophy stop you from using gut strings. This was a concern of mine, but after some consultation with another person who believes in the same philosophy as me, I'm convinced that I can use gut strings and not be religiously punished for it (almost). 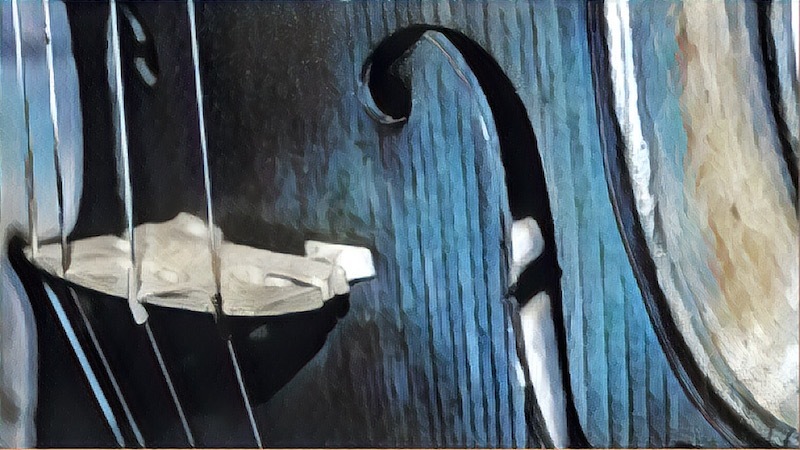 I agree with you: gut strings last almost forever, specially the thicker ones. They come in a double length (120cm) so in fact you are buying two in one. I'm vegetarian too but Ella expressed very well: gut strings are made from the leftovers of killed sheep. One part of that killed gut will be with me during one year, although I would prefer that the alive gut could be around when I'm playing. Sometimes I think about the gut that's in my viola and I play a religious music in order to thank that part of her that is with me. My cat loves gut strings. He destroyed two A, settled in viola. April 17, 2017 at 02:46 AM · I chose gut, but am using synthetics right now. I disagree gut doesn't last as long as synthetics. Very much pure marketing talk. Have NEVER experienced it. Synthetics eventually give up faster. BUT synthetics are generally fine strings, providing much "needed" convenience to most string players. In quotes, because one really doesn't "need" the beloved stability that much. I am enjoying my current set, but must admit the tone doesn't have what my gut core strings provided-obviously enough. I do find it problematic to judge players by the type of strings they use... as it's their "musical business" whatever works for them. That said, I do advocate for players that have never used gut core strings to at keadt try them with an open mind, as there are pros there that IMHO more than cancel out the "cons". April 17, 2017 at 07:32 AM · After trying Eudoxa and Passione, I gave up on gut, at least for now. I liked the sound, but they went out of tune every 10 minutes. I don't see how anyone could put up with that much tuning instability. Perhaps I was doing something wrong. Evahs were too loud for my taste, though I can see how one would like them if they needed to project above an orchestra. I liked Dominants, but they became unresponsive after just 3-4 weeks of intensive practice. I put on a set of Violinos a couple of weeks ago, and I'm really enjoying them so far. My fingers love the low tension, and my ears like the sound. April 17, 2017 at 04:16 PM · Actually, the talk about guts having a shorter lifespan is not just from people selling strings, it's from professional violinists who use them all the time. I used them for a time, and they didn't last as long. But then there is Heifetz, who was changing them all the time. Endre Granat had a long conversation with me on the matter, they go out of tune easily and don't last as long. The period performance professionals who perform on gut strings on a regular basis sometimes have to change them during a performance. So no, they don't last longer than any other kind of strings, that's just not one argument to be accepted as truth. Unless you are okay with playing on false strings, and yes, if you have the wound gut and they don't actually break, you can do that for years. April 17, 2017 at 09:27 PM · I was told by a member of Berkeley Baroque Strings that they all have geared pegs so that they can retune their gut strings easily. April 18, 2017 at 02:02 PM · For general interest, and according to the late James Beament (from his "great" book, "The Violin Explained," page 210) "lute strings were divided into minnikins and CATLINS, and the "cat" prefix was transferred to gut." To address a couple of other issues from above comments. Unfortunately, horses do not like to have their tails cut off (they use them to chase flies away) and as I have heard it most bow hair comes from horses that have been butchered for food - I'm sorry to say because my older granddaughter loves horses and spent much time during Jr. and Sr. high school tending and riding them at a nearby stable (she got to ride free for also tending them) - she also plays violin and I never told her this. When I started cello in 1948 I used only gut and gut core strings then and for a number of years after. I practiced a lot and wore out about one gut A string per week. The surface of the bare-gut string would shed sufficiently in that time that it was no longer uniform enough to play in tune and would break. Obviously there is a link between production of gut strings and consumption of mutton. Figure out horsehair for yourself!